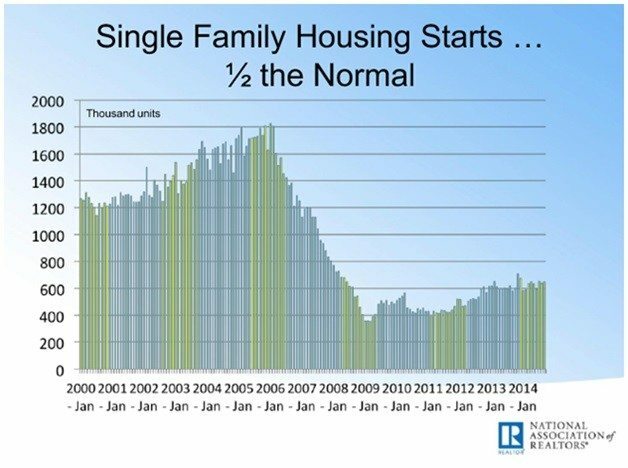 There has been a great deal of discussion regarding the consistently low housing inventory levels throughout the nation. Very little, however, has been written about the reasons why inventory levels are so low, especially following the economic disruption of 2008-2011. Understanding the why can be helpful in predicting how these factors might influence longer-term supply levels and future appreciation potential. This knowledge might also shed light on why inventory might remain constrained over the long run. 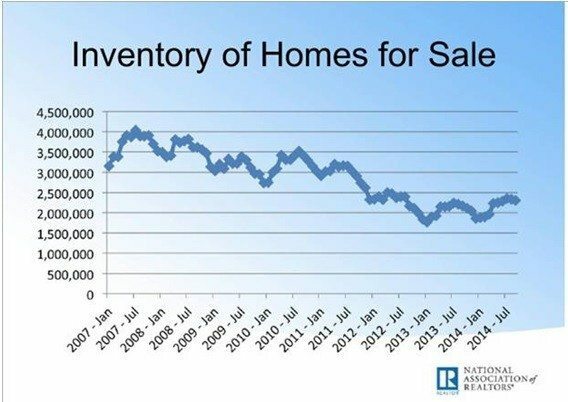 In the second half of 2011 we began to see an acceleration in the decline of inventory levels nationally, and since that time the available housing inventory has continued to remain historically low. The graph (figure 1) below highlights the continuous low-inventory environment. Why is this so? There are numerous conditions that have contributed to this phenomenon and bundled together have created an inventory control dynamic that, as prices rise, only serves to limit the number of homes available for sale. Prior to May 7, 1997, the only way you could avoid paying taxes on your home-sale gain was to use the funds to buy another, equal or more-expensive house within two years. I recall my father being motivated by a “move up” mentality. Every few years, he would sell our existing home for a bigger, more expensive property. He would explain to us that he was using tax-free money or “playing with the house’s chips” to leverage into a bigger home that only “someday” he would owe capital gains on. By leveraging his gains, he contributed to the health of the local real estate market. This dynamic created a steady supply and demand equilibrium not only in our local market, but in markets throughout the country. When he turned 55, another option became available. He could take a once-in-a-lifetime tax exemption of up to $125,000 in capital gains. However, when the Taxpayer Relief Act of 1997 became law, the rollover or once-in-a-lifetime options were replaced with the current per-sale exclusion amounts. The Taxpayer Relief Act allows homeowners to take a $250,000 (for singles) or a $500,000 (for married couples) capital gains/appreciation exclusion, which could be used under certain conditions every two years. While the Taxpayer Relief Act eased the home-sale tax burden for millions of homeowners, higher-priced real estate markets experienced an unintended outcome: fewer move-up buyers because their gains on their existing home exceeded the $250K/$500K maximum, thereby creating an unwanted tax burden. This frozen segment of the real estate pipeline has upset the flow of buying and selling activity. The typical move-up buyer has caused a bottleneck by remaining in place thereby reducing available supply to new entrants. The current law does not create the compelling motivation for individuals to continually move up into “bigger and better” higher-priced properties. In areas such as Silicon Valley, it is not uncommon for homeowners to exceed the $250K/$500K exclusion amounts if they have owned their primary residence for a period of time. Once a homeowner eclipses this threshold, their motivation to sell in order to move up diminishes as the possibility of a financial tax consequence looms. Many move-up buyers have begun their research only to discover they would be subject to capital gains tax on a portion of their gain — another sacrifice they are not willing to make in order to buy that bigger, better property. This factor is one of the least understood. Mainly because most people do not have large enough real estate gains to care or they are not old enough to begin pondering their longer-term estate plans and how the timing of their home sale might be impacted by capital gains tax exposure. For couples, upon the death of one spouse the tax basis of the ownership interest that belonged to one spouse is stepped up, the tax basis of the entire asset might be stepped up to “Fair Market Value” (FMV). * This means a surviving spouse can potentially sell their property and owe only federal capital gains tax on the property’s appreciation after the death of the spouse, which might drastically reduce the tax consequence of the sale. It is very likely that a good percentage of longtime married homeowners in the higher-priced areas of the U.S. understand this dynamic and will opt to stay and wait, surprisingly to some, for one or the other to pass away before a move makes practical financial sense. If so, this would mean that potentially thousands of multimillion-dollar properties with swollen appreciation are being held off the market until an unfortunate family loss occurs at some point down the road. Given the sustained low interest rate environment, many homeowners and investors have either purchased or have now refinanced and are locked into tremendously low interest rates over the past six years. It is highly unlikely that these homes will be coming up for sale anytime soon as a result of this favorable financing. In addition to the sustained low interest rate environment and its potential damper on those properties actually coming up for sale anytime during the life of their loans, we should mention the “value disruption” factor that occurred between 2007 and 2010. If you combine the sustained low interest rate climate with the thousands of homes purchased at up to 50 percent discounts or more, it’s unreasonable to expect that these homes will be coming up for sale anytime soon. In addition, an unprecedented number of institutional investors entered the residential real estate market acquiring large pools and blocks of properties. This inventory is now also frozen and held. In some regional areas sales prices have reached or even surpassed the peak levels in 2007. However, this not a national phenomenon; some cities and regions across the U.S. are still below the historical highs of the mid-2000s. Until prices reach peak levels across the board these homeowners won’t be listing their homes for sale. Additionally, there is the current mentality among some homeowners that home values will continue to rise. Very similar to the mindset of people holding on to a stock because they expect it to rise, people believe their properties will increase over time. Right or wrong, this mindset has become another factor in the tightening of inventory. What typically happens is that once homeowners realize the up cycle has turned, they electively decide or are forced to sell due to job loss or other negative economic pressures. This would result in a significant inventory increase. We have already mentioned a few of the constraints on the move-up buyer. The aforementioned forces feed on each other and further exacerbate the move-up opportunity. Lower inventory begets lower inventory; a downward pressure cycle continues. If one cannot find properties to move up to, they will not list or sell their current homes. This same dilemma plagues retirees finding limited or no options for retirement communities in their local area. This also limits housing supply on the top end of the market since seniors are not motivated to sell unless they know exactly where they are going. Over the past seven years (since the beginning of 2008) there has been an unparalleled low level of new housing starts (figure 2). This prolonged decrease in new home development dramatically multiplies the low-inventory gap. To further the dilemma, the start-to-finish build cycle is lengthy, often requiring multiple years to plan, approve, build and market, which slows market momentum. Until the new housing development engine gets moving at an accelerated pace it will continue to have a lingering impact. These major factors have created this extraordinary nationwide low-inventory environment we are currently experiencing. Given the factors above, inventory will remain low for an extended period of time, the natural solution of which remains unknown. *This depends/varies by state of residence and ownership. Figure 1 & 2 – National Association of Realtors, Lawrence Yun, Ph.D., NAR chief economist, presentation at Residential Real Estate Forum at the 2014 Realtors Conference & Expo in New Orleans, Louisiana, on Nov. 7, 2014. Retrieved from: http://www.realtor.org/presentations/presentation-residential-real-estate-trends-and-outlook. Chris Trapani co-founded Sereno Group with his father, Marko Trapani Sr. and his lifetime best friend, Ryan Iwanaga. Sereno Group has blossomed to eight offices and over 250 experienced Realtors in less than nine years. The company has established itself as a proven market leader and consistent community supporter partly through its 1% for Good Program. In 2014, the company closed over $2.4 billion in sales with an average sales price of $1 million. Follow the Sereno Group on Facebook.